DC101's Chili Cook-Off rocked RFK Stadium on Saturday May 21, bringing in thousands of fans with a line up that included Weezer, Papa Roach, Seether, Panic! At the Disco, Neon Trees, Paper Tongues, and Middle Class Rut. The event was also true to its namesake, featruing 101 of the Metro area's top chili cooks (with team names including Arnold's Illegitimate Chili, F.A.R.T., and some that we cannot repeat on this website) -- all competing for top honors in International Chili Society-sanctioned categories that included Red, Green, Salsa, Freestyle, and People’s Choice. Brave judges for the cook-off included “Top Chef” star Spike Mendelsohn, Kory Lichtensteiger and Clint Oldenburg from the Washington Redskins, Visanthe Shiancoe of the Minnesota Vikings, Cat Ommaney from “Real Housewives of DC,” WUSA9's Anita Brikman and even Metromix's own Jason Adams. 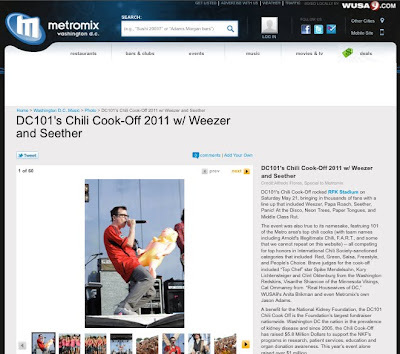 A benefit for the National Kidney Foundation, the DC101 Chili Cook Off is the Foundation’s largest fundraiser nationwide. Washington DC the nation in the prevalence of kidney disease and since 2005, the Chili Cook-Off has raised $5.8 Million Dollars to support the NKF's programs in research, patient services, education and organ donation awareness. This year’s event alone raised over $1 million.